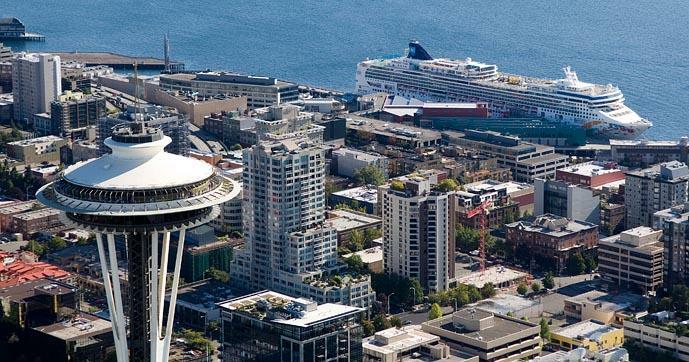 The Bell Street Pier Cruise Terminal - Pier 66 - anchors an 11-acre complex along Seattle's downtown waterfront. Pier 66 is an easy walk to the famous Pike Place Market and Seattle Aquarium. Bell Street Pier is home to: - Oceania Cruises - Norwegian Cruise Line Passenger Amenities*: - Cruise terminal concierge offers luggage storage before and after cruises, plus city information. - Wheelchair, scooter, and oxygen rentals. Equipment can be delivered directly to guest cabins. - 1,700-space parking garage directly across the street offers secure parking and a complimentary shuttle to terminal. - Restaurants, deli/mini-mart with ATM and recreational marina on-site *Note: Check with your cruise line for availability of onboard airline check-in and luggage handling that allows guests to check in for their airline flight, print boarding passes and check their luggage; all while still on board their ship. Parking at Pier 66: The Bell Street Pier garage is available to all cruise passengers. Conveniently located directly across from the cruise terminal, it offers 1,700 spaces of covered, secure parking. General parking is available for $21 per day (includes taxes).